ChurchMag / Web / Open Source / Free My Dim Dim! With a name like “Dim Dim” who wouldn’t be curious to check it out? It’s got that a cute ring to it. 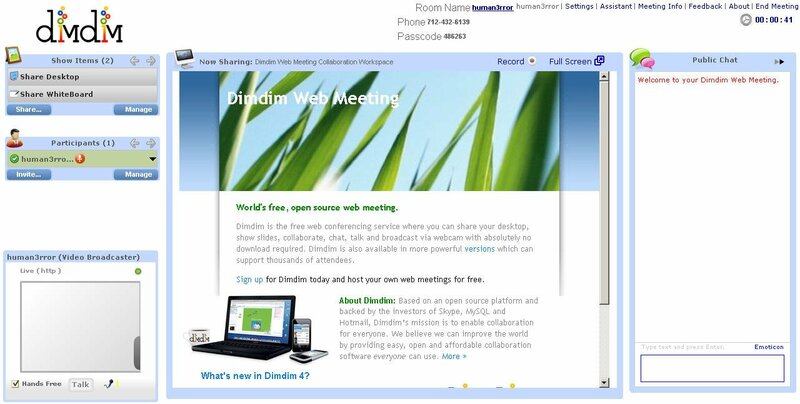 Dimdim’s mission is to become the leading provider of open source web meeting software. Dimdim strives to be an open and transparent company, with source code, product roadmaps and simple technical documentation freely available online. We also listen closely to the needs of the open source community and are actively improving our product based on their feedback. Recording: You can now record your meetings and share playback URLs or embed the recording directly onto your own website just like YouTube videos. Multiple Presenters: With a single click you can allow any attendee to share their presentation, whiteboard, webcam – even their desktop. Mac Desktop Sharing: Mac users can share their desktop with anyone using just a browser. Free Teleconferencing: While we’ve improved our free VoIP microphone sharing everyone now gets their own unlimited free conference call account. Private Meetings: Simply assign a meeting key and only those who know both your meeting room name and your meeting key will be able to join. No Install: Now you don’t need to install anything to join or even host a meeting. You’ll only need to install our screencasting plug-in if you choose to share your desktop. Thing is sweet. Creating and starting a meeting is super fast… you don’t even have to confirm your email address. Takes about 2 minutes from start to finish. So, if you’re in the market to try some new web software for collaborating in your ministry, I’d check this baby out. And if I had some extra time, I would definitely be all up in this!